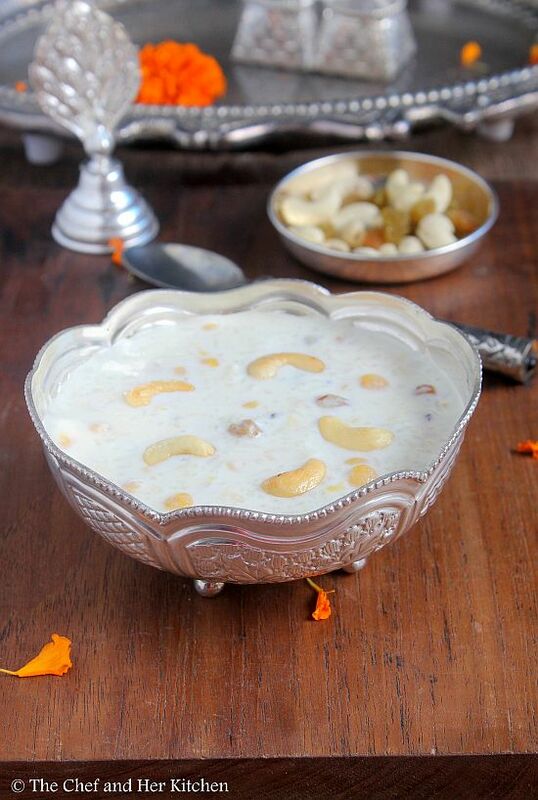 Paal Payasam is one of the most important offerings to Lord Krishna for Krishna Jayanthi. My mom usually prepares it by boiling the rice in milk over stove top which is very time consuming but it adds a nice creamy taste to the kheer. I have already posted that version of Paal Payasam prepared on stove top earlier. This time I am posting a quick recipe for Paal Payasam using pressure cooker method and also by giving a small twist by adding chana dal. We do make another kheer variety with Rice and Chana dal combination with the base being coconut-khus khus mixture which is a very thick and creamy kheer- I would post it some other time. 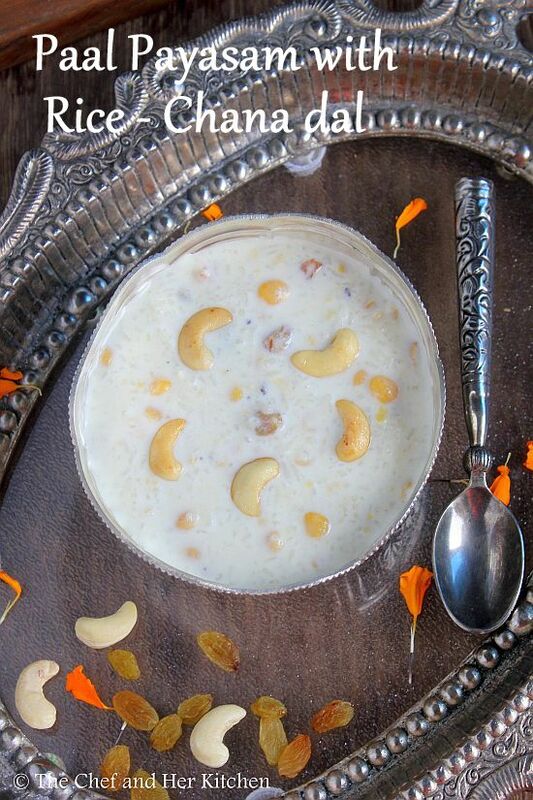 My MIL makes a similar version of kheer(rather you can say halwa as the texture would be very thick) in North Indian style where she uses basmati rice and pressure cooks it in more quantity of milk for longer duration until it forms like thick mawa, I am yet to post this in my space. It seems like my recipe list to post is never ending. Coming back to today's post - Paal Payasam with Rice and Chana dal, if you want you can avoid chana dal and follow the same recipe but the addition of chana dal adds a nice bite to the kheer. 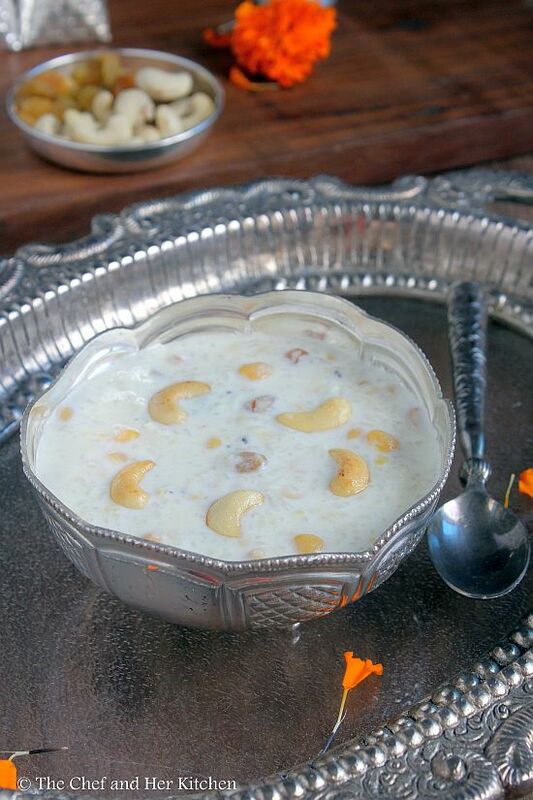 We have a tradition to prepare this Paal Payasam for house warming using the milk which we use for the milk ceremony and is considered good for us. Wash and soak chana dal for half an hour. You can avoid chana dal in the recipe. Clean the basmati rice and keep it ready. You can either pulse it slightly or use the whole basmati rice as it is. Heat 1 tsp ghee in a cooker or thick deep pan and dry roast basmati rice slightly until the moisture evaporates and add chana dal and 1.5 cups of milk roughly and pressure cook for 2 whistles. If you are cooking directly in the pan, it takes quite longer but you need to add more milk for cooking it. Once the pressure drops you can add remaining 3- 3.5 cups milk and sugar and let it boil on low flame for 12-15 mins. 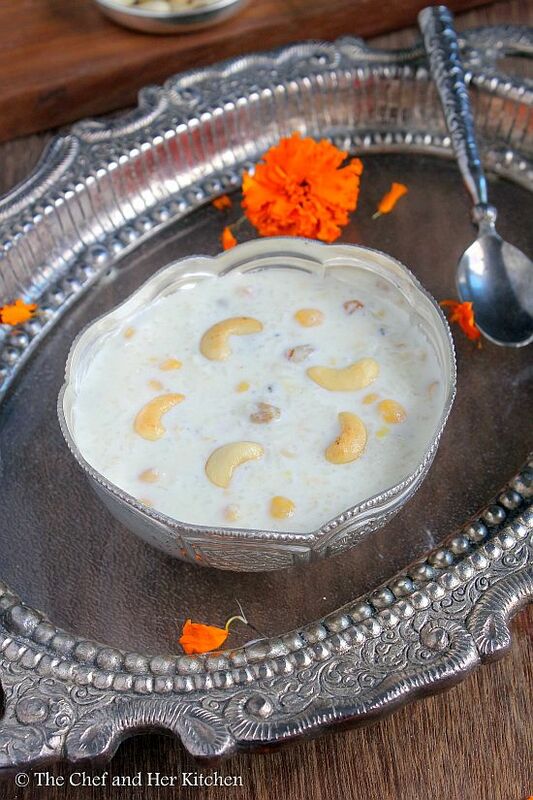 The kheer thickens slowly and it also would become thick as it sits, so make sure you switch it off accordingly. Meanwhile heat remaining 2 tsp ghee in a pan and add cashew nuts and fry them until they turn golden color and remove them and keep aside. Add Raisins and fry until they bulge and remove them as well. Just before removing it from stove add cardamom powder and fried cashew nuts and raisins and mix well. Serve it warm, hot, cold or at room temperature. Chana dal is optional in the recipe, but it adds nice bite to the payasam. Give it a try with chana dal its nice. You can even add saffron strands soaked in milk to the kheer at the end which will give a nice saffron color to the kheer. 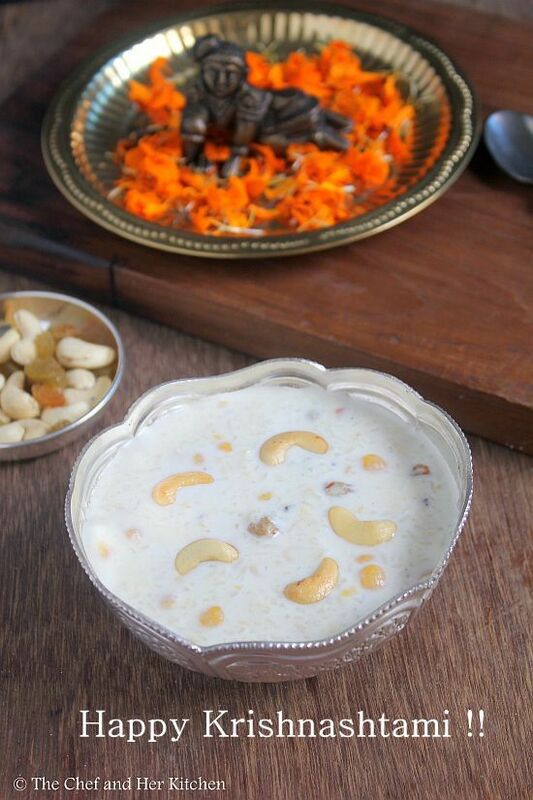 The addition of nuts and raisins is again optional, but for me any kheer is incomplete with out nuts. If you are short of time you can pulse basmati rice in mixer so that it can be cooked faster. If you have rice rava you can even use it. Basmati rice adds a nice flavour to the kheer, hence I suggest to use basmati rice for this kheer. But you can use any rice variety also. Wishing you all Happy Krishnashtami in advance!! Check out my Gokulashtami recipe collection for more recipes for Janmashtami. 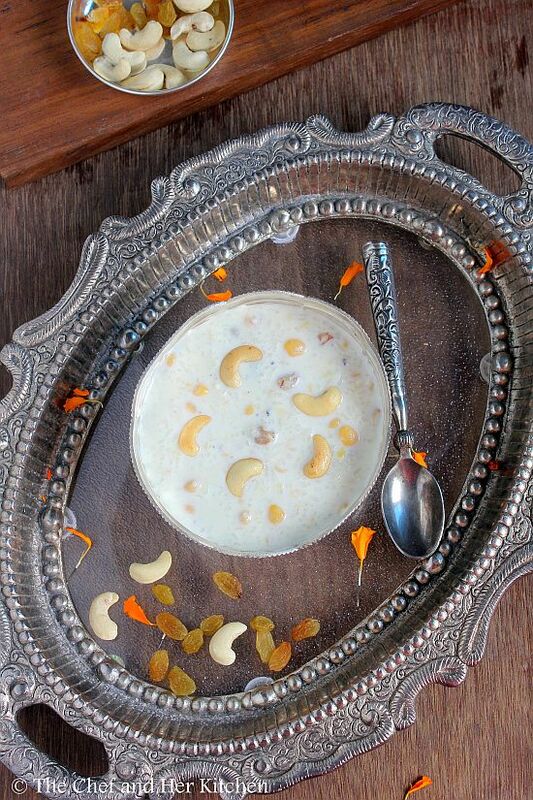 Delicious and comforting looking payasam. It's indeed a tempting preparation. Nice recipe prathy, looks delicious! Addition of channadal in paal payasam sounds interesting,creamy and delicious. Hello from Kuwait! I just love the recipes on your blog. I can see that you love cooking, plus, you have taken a great deal of trouble to share your wonderful recipes and pictures with all. God bless you! Loves the presentation... and the photos!! So tempting.